Hiroko Matsumoto was an iconic Japanese model and actress. Born in Japan in 1936, Matsumoto is credited with paving the way for Asian women in the modeling industry. 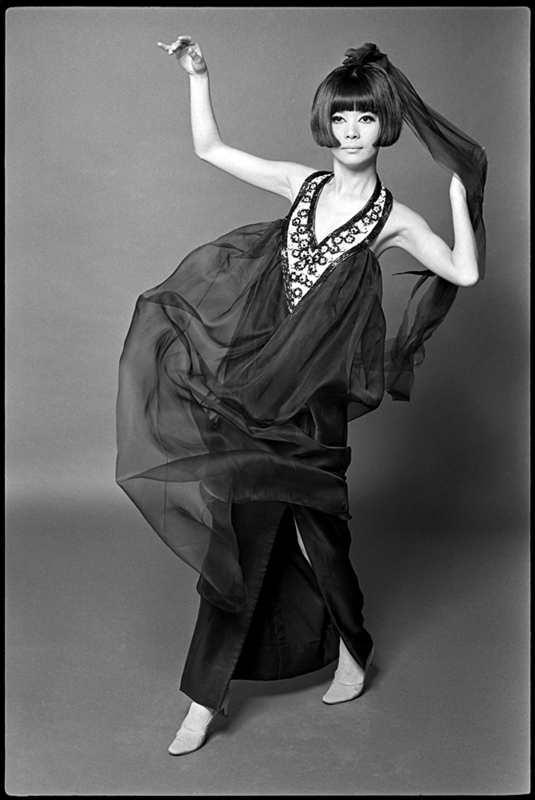 As the longtime muse of Pierre Cardin, she was often photographed exclusively in his designs. Known as “Miss Hiroko,” she was the first ever Japanese model for a French clothing collection. Duffy photographed Matsumoto twice during his time with French Elle. The first was in 1964 where she modeled a vivid purple Pierre Cardin dress in front of a projected background which can be seen here. This picture was published in Elle No.1054 on the 3rd of March 1966. Again Matsumoto is modeling Pierre Cardin. See the original here. By 1967 Matsumoto had ended her modeling career but later emerged in 1970 playing the character Kyoto in French director François Truffaut’s movie “Bed and Board.” This, however, was her only acting credit. Hiroko Matsumoto sadly passed away June 21st, 2003 in Paris at the age of 67.